I am not sure how people do it without insurance. I guess some dont. Kathleen through UofW has an incredible drug plan. Without it… Well, the retirement savings would be gone. Today she got a new drug http://en.wikipedia.org/wiki/Pegfilgrastim to help keep up her whiteblood cell count. If the count is too low, she cant take chemo. So, its kind of necessary. Below is a pic of the receipt. We paid five dollars. If we didnt have the ‘super awesome private drug insurance’ through Kath’s work… Well, you could buy a nice new Toyota Camry for a cycle. Click on the image to make it bigger to see the fine print. The injection was done in 3 seconds… about nine hundred dollars a second. Eyebrows were raised while jaw was open. I am Kathleen's partner of almost 25yrs supporting her through this very tough and rough spot. You could buy a lot of wine with just one payment of the drugs. I guess you both have lots to be thankful for this weekend. I”m sure that you’re getting together with friends and family over for the weekend. Have a wonderful thanksgiving weekend. Hope to see you sometime next week if that can work out. Big hugs to you both. P.S. Well done on the run last week! WOW. Have a Happy thanksgiving. Yes, thank goodness for insurance! I took Neulasta as well. Got it after every chemo cycle. Not sure what my dosage was and how it compares to Kathleen’s but I did find that after taking it, i woudl have this sort of bone pain. It’s probably a kind of “some people get it, some don’t” but I needed advil for it. it was an achy pain in my legs and I think it also made me feel blah. I believe the doc said it’s caused cause the marrow is working to produce extra white blood cells. But it also seemed to work real well in boosting my wbc count. Good luck with it and hope to see you guys soon! 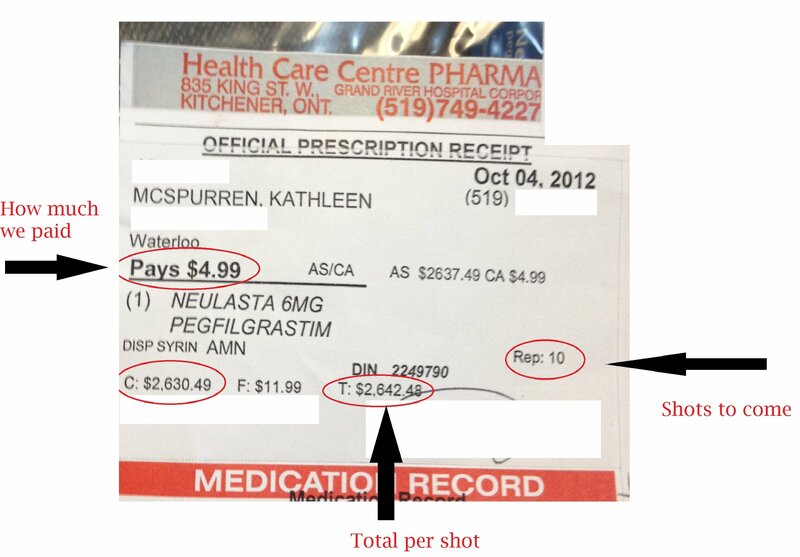 The Trillium Drug plan willhelp some out – There is a max % of your income after which the Province pays. I think I pay $2K a year for both Dan and I and the rest is free. Pymnts are quarterly. So — I had it wrong on this one example. $26 thou plus for 10 shots.